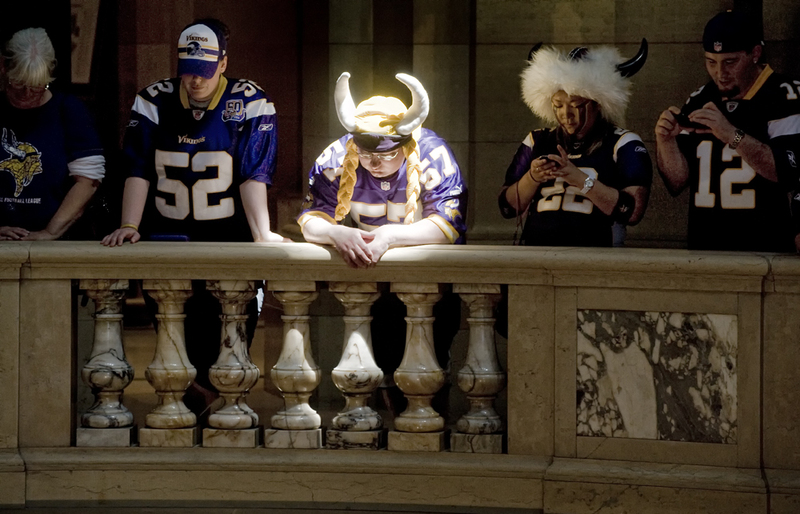 An NFL Commissioner, team owners, a Governor and guys dressed up like 9th century Noresmen, gather at the Minnesota State Capitol to battle for a few hundred million to build a new home team home. Vikings fan, Kyle Nagorski, is caught in a beam of sunlight as he watches Gov. Mark Dayton signs a $975 million football stadium bill for the Minnesota Vikings during ceremonies in the rotunda of the Capitol. Gov. 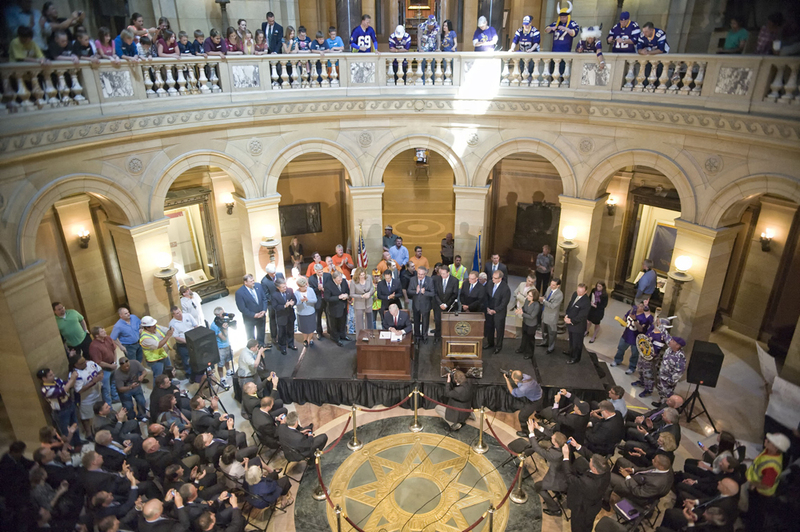 Mark Dayton signs a $975 million football stadium bill for the Minnesota Vikings during ceremonies in the rotunda of the Capitol. Mike Halvorson, left and Diggz Garth of the Viking World Order leave Gov. Mark Dayton's office after a nice pillage (and leaving messages). Reflecting off an eye patch, Kristin Raffery, who is opposes funding a new Vikings stadium, talks with, Gregory Hanson outside the House Chamber. 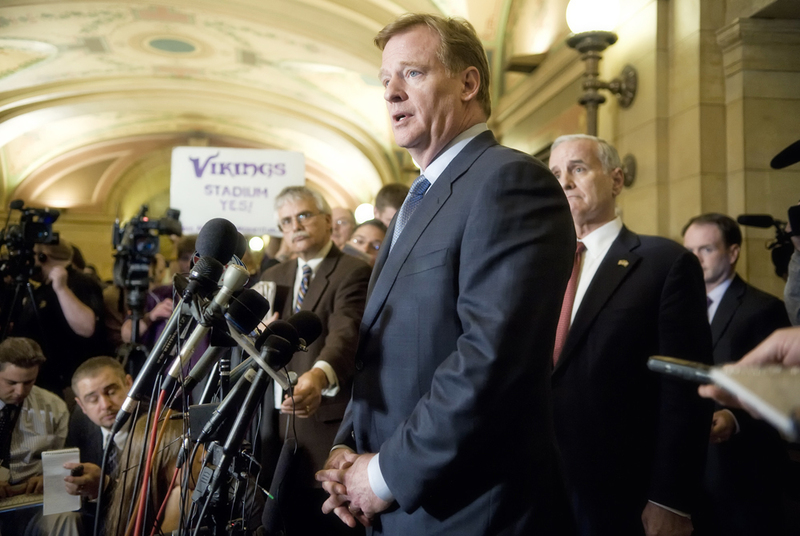 The Vikings stadium bill will not get a vote by the House and Senate until agreements can be reached between the governor, a democrat and the republican legislature on taxes and bonding. NFL Commissioner Roger Goodell, talks with the press outside Gov. Mark Dayton’s offic. Goodell met with Gov. Dayton and legislative leaders from both parties. After the one-hour meeting Gov. Dayton, the NFL officials and legislative leaders talked with the media outside Dayton’s office. 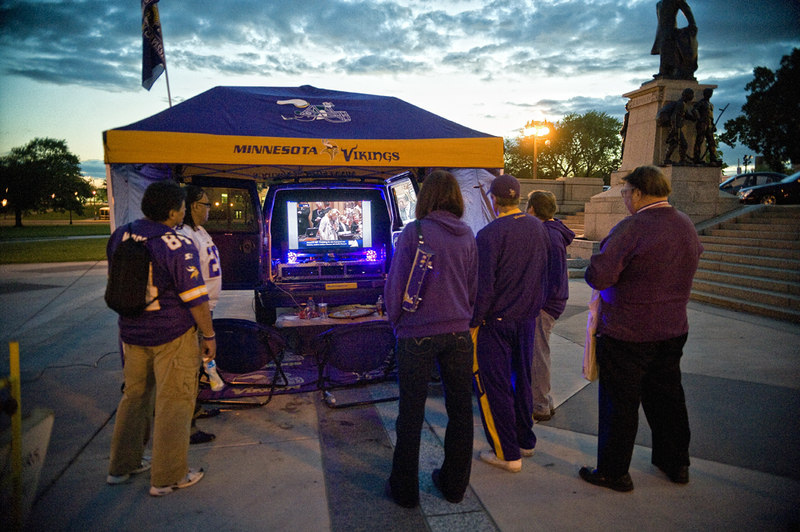 Vikings stadium supporters watch as the Senate debates a new football stadium proposal for the Vikings as they tail gate in front of the Capitol. A tired, but a good kind of tired. Vikings stadium supporter Gregory Hanson, right, talks to Paivy Ballayan, left, who is blind and Kristin Raffery, who oppose the stadium, outside the House Chamber. 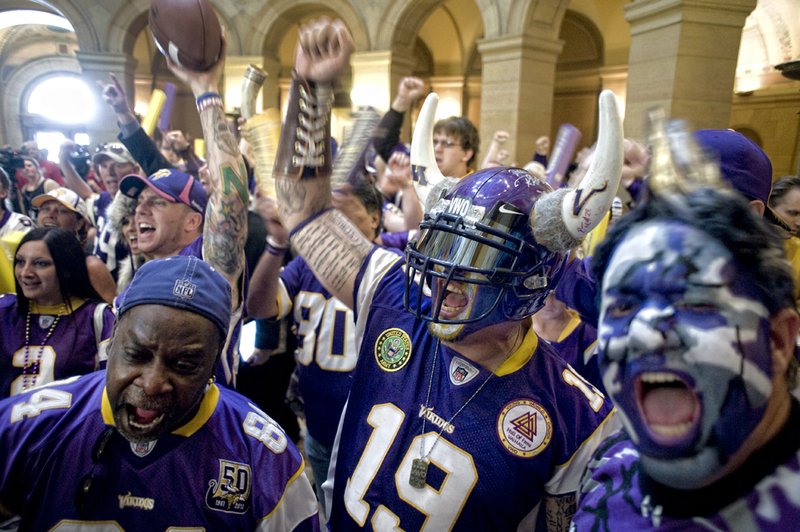 Members of the Vikings World Order rally in the Capitol Rotunda for the House and Senate to pass a football stadium bill for the Minnesota Vikings. The House passed the Vikings stadium bill 73-58. Carey Lundberg, who's Vikings fan name is "Val Carey" came to the Capitol to join the other lobbyist at the Capitol as the House of Representatives was hearing a stadium bill for the Vikings. Val Carey was lobbying in suport of a new football stadium for the Vikings. 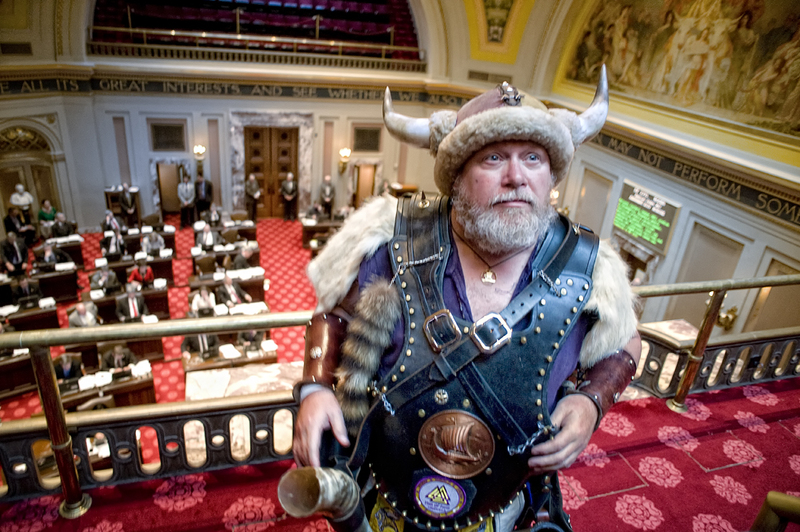 Gregory Hansen finds his fellow Vikings stadium supporters in the Senate gallery as members of the Senate debate a new football stadium proposal for the Minnesota Vikings. 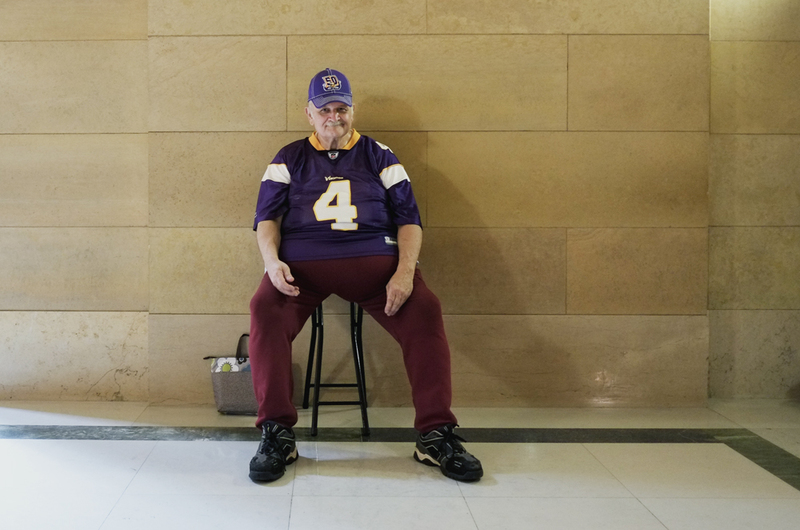 Brett has kinda let the body go since retiring but he was able to throw on his old Vikings jersey and make it to the Capitol to support a new stadium for the Vikings. A stadium bill was heard and passed by the House of Representatives 73-58. Gov. Mark Dayton checks behind him (for Noresman of course) before talking about the new $1 billon stadium bill for the Minnesota Vikings. After the one-hour meeting Gov. Dayton, the NFL officials and legislative leaders talked with the media outside Dayton’s office.